Criterion offers five different configurations of zip and neck baffles within our sleeping bag ranges. 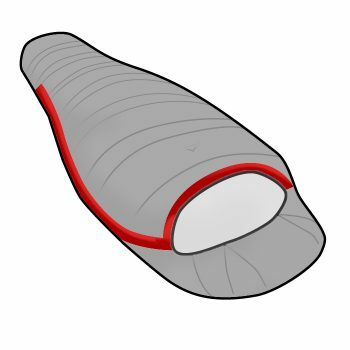 These offer the best warmth to weight ratios for the activities our sleeping bags have been designed for. 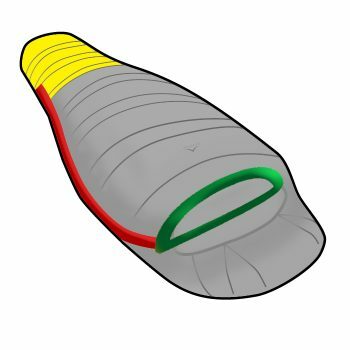 All Criterion sleeping bags use full-length YKK zips which allow easy access and egress and full zip venting. 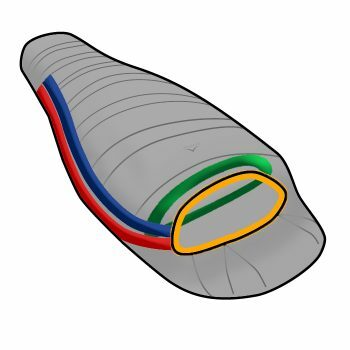 However, zips create cold spots, each zip is therefore protected by a "zip baffle". This is a tube containing down insulation that covers the zip along its full length and ensures you stay warm inside. To help prevent the zip from "catching" and damaging the sleeping bag an "anti-snagging" feature has been incorporated into all of our designs. 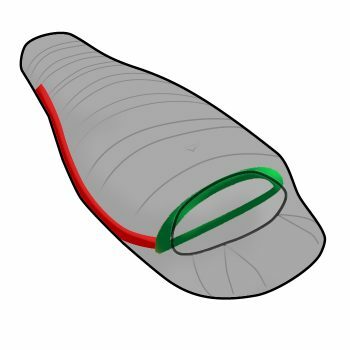 Neck baffles are an insulated collar designed to prevent cold draughts and help to insulate the body by reducing the heat loss due to having an open hood, neck baffles allow the bag to be drawn tighter around the neck and shoulders which traps heat within the body of the bag. The baffle is drawn snugly around you by a one-handed pull on its drawcord. The drawcord is elasticated to allow for "give" when you are turning over in your sleep. In addition to having a drawcord closure, the neck baffle is also fastened by a velcro strip. When not in use (for example during warm nights) the "hooked" part of the velcro strip can be folded back and held in a closed, hidden position by the use of a cleverly positioned secondary velcro, which prevents hair, clothing, fluff, dirt and other unwanted "bits" from catching in the hooks. A full-length baffle which runs the full length of the zip, using 680FP down. This is used in our Ultralight models and is ideal for those looking to save weight. Used exclusively in our Quantum range, a full-length baffle runs the length of the zip and covers the neck. The baffle is made with Pertex Quantum 35g/m² fabric and 870FP Diamond Grade Down. This is an ideal combination for an ultra lightweight bag, saving weight whilst providing insulation. Used in our 3 to 4 season Traveller and Prime ranges. Our separate zip and neck collar system, offers a full-length zip baffle, with a fully independent and adjustable down-filled upper and lower neck collar with Velcro fastening and differential fill. The zip baffle and collar fill power is either 680FP (Traveller) or 870FP (Prime). Only available in our Lady range. This 680FP system offers a full-length zip baffle, with fleece lined footbox for added insulation and comfort. An independent and adjustable full neck collar insulated with down traps air and can be used open or closed. Exclusive to our range of Expedition sleeping bags. This system consists of two full-length zip baffles and a fully adjustable down-filled neck collar. An additional down baffle on the hood allows it to be drawn tighter protecting the face from the elements. All down is 870FP.